Cape Coral Clubs - Find out about some of the clubs you can join to make new friends, and for fun and socializing. If you've just moved to the Cape, you may have met neighbors, made some friends at work or church, or the parents of your kids' friends. If not ......... and even if you have, you might want to join a social club to meet new people. Cape Coral has private clubs such as the German American or Irish American Clubs; Rotary, Kiwanis, Moose, and American Legion Clubs; as well as the Palmetto Pines Golf and Country Club. You can also join a Boat Club, Diving Club, or any of the area online MeetUp clubs for anything and everything you can think of. I've been fortunate to have friendly neighbors and make some great friends ........ and you will too! As a newcomer, the first club you should know about is the Cape Coral New Residents Club. The club was founded in 1967 and is open to people who have lived in Cape Coral 3 years or less. The club is open to full and part time residents and welcomes both marrieds and singles. Some of the activities are monthly dinner dances, cocktails, ladies luncheons, and coffee socials. For outdoorsy types, the club organizes cruises, boating, kayaking and fishing trips, golfing, plus art, plays, concerts, and nature outings. Special interest groups include cooking, sports, games, and movie and book discussion get-togethers. Once you've graduated from the New Resident Club, you can join the Cape Coral Social Club, which is open to all Cape Coral residents as well as those in surrounding areas. Friendships and fun continue in a welcoming and friendly environment with monthly dinner and dance parties, plus activities, games, trips, cruises, boat outings, lectures, and more. Meetings are held the second Thursday of the month at the Yacht Club ballroom, starting at 9:30AM, and featuring entertaining and informative speakers. Not only will members enjoy social activities, they'll also learn more about the community of Cape Coral and its services. 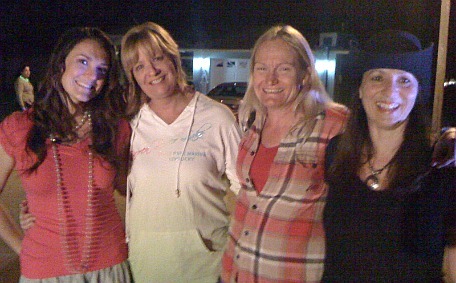 See my Cape Coral Blog, where I'll post their monthly activities! The German American Club is home to the biggest Oktoberfest in Southwest Florida! They have extensive grounds with lots of shade trees, bandstand, outdoor seating, and several buildings which make it the perfect spot for a festival. Other festivals include Mangomania ........... and the Blues, Colombian, Seafood and Car Show, and Irish Festivals .......... as well as Karneval and Bavarian Garden Fests. 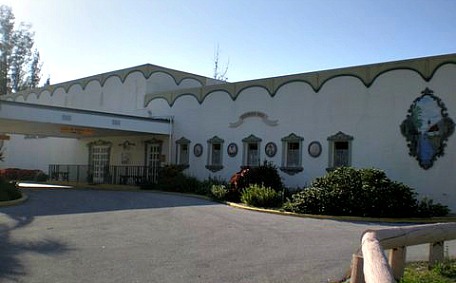 The club was formed in 1964 and members can enjoy Friday night dinner dances, entertainment, and various interest groups. You don't have to speak German to join, you can go to one of the dinner dances and become a temporary member while the board reviews your application. Check out their flea market on Thursdays from November - March, 7AM-1PM. The next of the Cape Coral clubs that I want to talk about is the Cape Coral Rotary Club, which was formed in 1964, and is a group of business people and professionals dedicated to service and goodwill. They meet for breakfast every Wednesday at La Venezia at 8:30AM. Anyone involved in business in Cape Coral and is known to be honest, fair, and upright is invited to join. The club sponsors 2 popular festivals, The Festival of Arts and the Cardboard Boat Regatta. Rotary Park is dedicated to the club for their efforts and projects for the Cape Coral community. 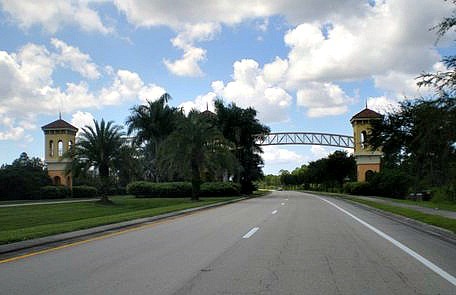 The Rotary Club was involved with the building of the Memorial Arch at the entrance to Cape Coral on Del Prado Blvd North, Cape Coral Hospital, Cape Coral High School Stadium, roads, parks, and loads of other projects including building a learning center, bicycle racks at schools, and helping boy scouts and girl scouts. Cape Coral Kiwanis - This club wants to change the world one child and one community at a time, by working together. They particularly like helping youth, providing scholarships, being involved in spiritual, community, and international services, the environment, and leadership. They meet on Wednesdays at 6:30PM at their lodge on 360 Santa Barbara Blvd. Similar clubs include the Cape Coral Moose Lodge #2199 at 151 Santa Barbara Blvd, (239)242-8029 .......... and the American Legion Club at 4720 SE 15th Avenue, call (239)540-8128. The Cape Coral Irish American Club seeks to promote Irish culture through music, poetry, and various events. 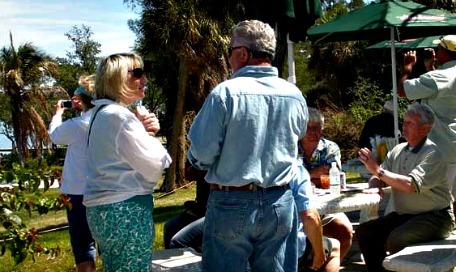 Palmetto Pine Golf and Country Club - Join them for golf, dinner, activities and socializing. Cape Coral Cruise Club - Founded in 1963, this boat club owns their own private island on the Caloosahatchee near Alva where members can enjoy monthly picnics, play bocce, horseshoes, and other activities. Cape Coral Diving - Go to my page to read about Lee County's system of natural and artificial reefs, and sunken ships for excellent fishing and diving, and to find out about the diving club. 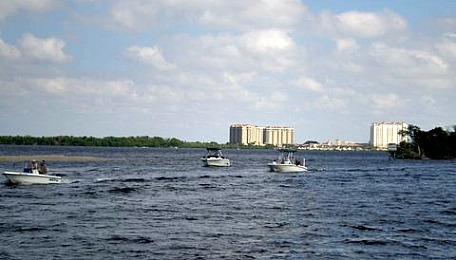 The Cape Coral Sail & Power Squadron features boating groups, boating safety classes, and social events. MeetUp - Another idea for meeting people is to join a MeetUp group. What you do is go online and google MeetUp, see if there are any Cape Coral clubs or groups in the area based on your interests, find one or more groups, sign up, make a profile with your photo and information, and receive emails with upcoming activities. You then let the group organizers know if you're attending ......... then go! You'll find groups such as wine tasting, kayaking, moms and toddlers, singles, coffee lovers, photography ...... and so much more! Don't see a group you like? Then form your own! Cape Coral Churches - Another great way to connect is through church! I've found some of my closest friends through Bible studies, moms and other groups, church dinners, and Sunday School. Cape Coral Boat Rentals, Sales, and Clubs - Once you've made friends and want to enjoy the boating lifestyle of Cape Coral, but don't want to buy a boat .... you can join a boat club for far less than owning one. As you can see, there are many Cape Coral Clubs where you can meet people and do so many fun things. There's no excuse, so get out there and enjoy life!